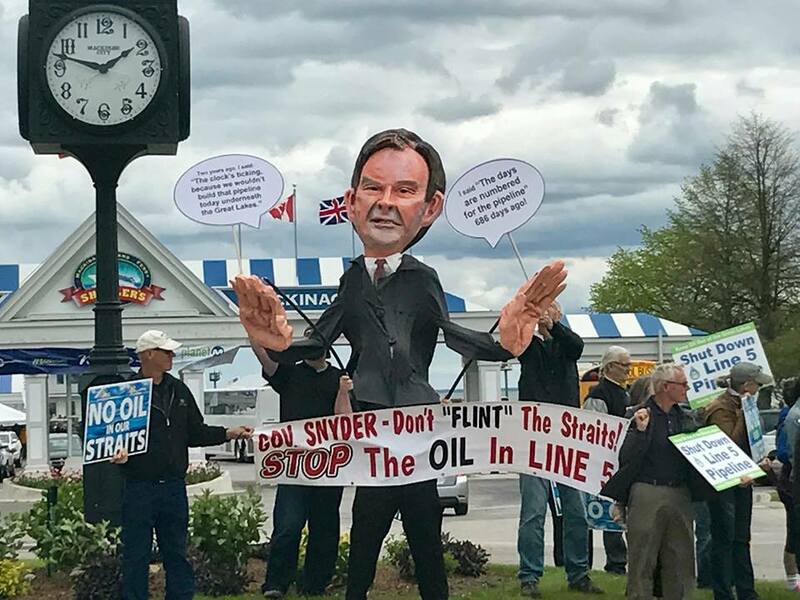 Last summer, Clean Water Action began participating in stakeholder meetings convened by the Michigan Department of Environmental Quality (DEQ) at the behest of Governor Snyder. The purpose of these meetings was to identify gaps and recommend updates to Michigan’s Lead and Copper Rule (LCR). At the beginning of this year, Clean Water Action offered its recommendations to DEQ – calling for the LCR to be strengthened in order to ensure all Michiganders have access to safe, drinkable water. More than 5,000 Michigan members responded to our call to action and submitted public comments urging DEQ to finalize a rule that would make Michigan a leader in reducing lead at the tap. In April, DEQ released its final version of the rule. Many of the items our members called for were included in the final rule. Perhaps most notably, there is a requirement for water systems to replace all lead service lines, including partial lines. This is a huge step to ensuring that the estimated half-million lead service lines across Michigan, that each day threaten the health of our communities, will be removed. There are still some shortfalls within the LCR, but Clean Water Action will continue to work with DEQ and other stakeholders to revisit and strengthen this rule in order to protect our most vulnerable communities from the harmful impacts of lead contaminated water. Thank you to the more than 5,000 members who submitted their comments on behalf of clean water. Though we are making progress, there is still a lot of work to do be done to ensure all Michigan’s waters are protected from the impacts of failing infrastructure, lead contamination, PFAS and PFOA, and oil spills. One way Clean Water Action is working to protect and improve water quality in Michigan is by educating lawmakers and holding them accountable to their campaign promises. Join thousands of Clean Water Action members today by signing our pledge to hold your lawmaker accountable to their voting record on water and public health policies. Let them know you are paying attention and will be voting for the environment at the ballot box in August and November! Over the past several months, the Snyder Administration’s plans for Line 5 have started to materialize. Governor Snyder’s deal with Enbridge from November 2017 essentially limited the options that the state would explore for Line 5 replacement, leaving only options that favor Enbridge and the continued transport of oil and gas through the Great Lakes. In April, a tug boat anchor struck Line 5, leaving at least three large dents in the pipeline, causing the federal government to get involved and put Line 5 on the same flow restrictions that Line 6B was on when it spilled 1.2 million gallons of tar sands oil into the Kalamazoo River in 2010. Both the primary and secondary safety mechanisms for Line 5 failed when the anchor struck the pipeline. This anchor strike should have been a wake-up call, but instead, the Snyder Administration is continuing to push forward with the idea of building a tunnel under the Straits of Mackinac and rebuilding Line 5 in the tunnel. According to the only study that has been completed on the feasibility of building a tunnel through the Straits, such a construction project would take at least seven years to complete, and construction costs alone would be over $550 million. Those construction costs do not account for overhead, permitting and legal compliance, or profits for the companies that would be doing the construction. Further, the seven-year timetable is only for construction itself. It does not include time to obtain the 39 separate state and federal permits that would be necessary before construction could begin and would likely be challenged at every step of the way. So in reality, this tunnel idea that is being favored by state officials, and the oil and gas companies that contributed to their elections, is at least a 10 year long major infrastructure project that would leave Michigan susceptible to spills from the existing Line 5 pipeline for at least another decade. Luckily, we have an election this November. An EPIC-MRI poll came out recently showing that 87% of Michigan voters are concerned about the possibility of a Great Lakes oil spill from Line 5 in the Straits. Candidates for Governor need to be outspoken on this issue. The people of Michigan deserve to know whether candidates for the top office in state government intend to stand for our Great Lakes by decommissioning Line 5, or stand for Enbridge and the industry that is trying to buy our government, by paving the way for an oil tunnel to be built through the most sensitive part of the Great Lakes ecosystem. 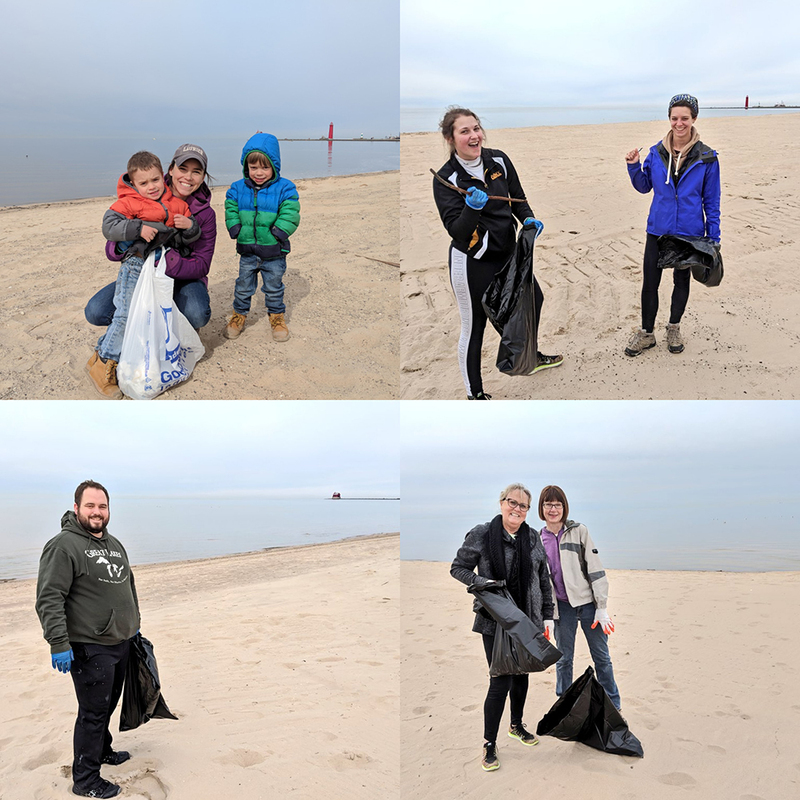 On Tuesday, May 22nd, Clean Water Action staff, members, and volunteers came together to recognize the extraordinary work of some of Michigan’s fiercest water advocates at the annual Great Lakes Awards Celebration. This years’ celebration highlighted the efforts of individuals who understand that Water is Life. Each of the honored guests works in their own unique way to protect the Great Lakes and provide a future where all Michiganders have a right to clean water. We were especially pleased to recognize “The Water Warriors” - an enthusiastic team of 4th and 5th grade girls from Midland, Michigan who identified creative solutions to septic system failures as the topic of their Lego Robotics project after learning about the impact of these systems on ground and drinking water from a Clean Water Action canvasser. These future leaders understand how precious our water is and that we all have an important role to play in protecting it. We were pleased to have all eight team members, their parents, siblings, and team coach in attendance to receive the first ever Leaders of Tomorrow award. In recognition of his tireless advocacy and activism on behalf of the Great Lakes, Desmond Barry, Natural Resources Director for the Grand Traverse Band of Chippewa and Ottawa Indians, received the 2018 Hero of the Great Lakes award. Three years ago, Clean Water Action joined over 70 organizations, 250 businesses, and all 12 Native American Tribes in Michigan to call on our elected officials in Lansing to shut down the reckless, life-threatening Line 5 pipeline. These past three years, Clean Water Action and Desmond Barry have stood side-by-side: educating and mobilizing Michigan residents, holding lawmakers accountable, and elevating the Line 5 pipeline as the premier environmental issue in Michigan today. He has been a critical force in this effort. Clean Water Action staff were proud to award Mr. Barry this year and look forward to continuing to fight alongside him. Each year, Clean Water Action identifies and recognizes one elected official who is a leader in the fight for clean air and clean water. This year, Clean Water Action was incredibly pleased to honor one elected official who truly understands her obligation to preserving our water for future generations - State Representative Stephanie Chang. Representative Chang fights everyday to protect our children and communities from the harmful impacts of air and water pollution. Congratulations and thank you to Representative Chang, our 2018 Great Lakes Champion. 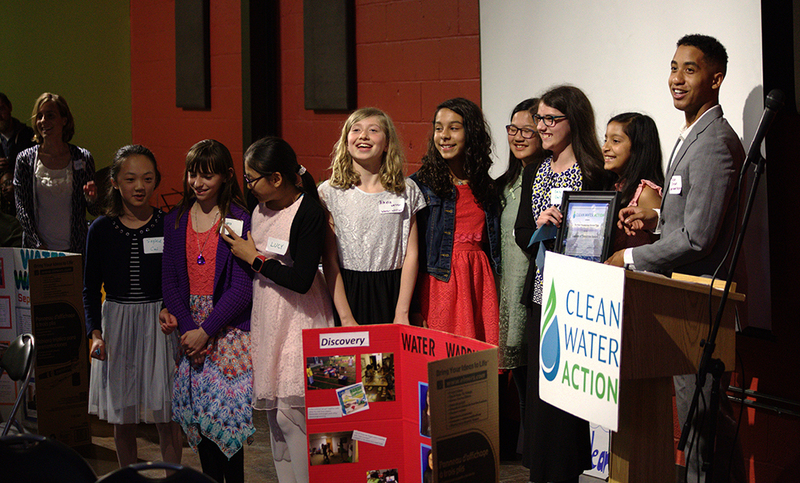 The “Water Warriors” receiving the Leaders of Tomorrow award at the 2018 Great Lakes Awards Celebration. Team members are Anjali Dash, Emily Gallant, Amelia Warner, Anise Wu, Jaya Khot, Lucy Tang, Sophie Cai, and Cara Bucci. Recently released emails between Environmental Protection Agency (EPA) officials, the White House, and the Department of Defense (DOD) have revealed that the three agencies have conspired to block the release of an Agency for Toxic Substances and Disease Registry (ATSDR) report on the health effects of PFAS compounds. PFAS is an emerging class of chemicals, that have contaminated drinking water sources in at least 30 different locations in over 15 communities across Michigan, and elsewhere across the country. The current EPA advisory limit for PFAS in water is 70 parts per trillion (ppt), however the ATSDR study supposedly argues that this advisory level is up to six times too high. This is not surprising, as the ATSDR findings are consistent with the findings of a recent Harvard School of Public Health Study. In Michigan, Representative Winnie Brinks has introduced a resolution calling on the White House to put public health before public relations and release the study. People in Michigan are already being exposed to these chemicals and we absolutely have the right to know the most up to date scientific information concerning the effects of PFAS exposure. Join us in calling on your representative, and Rep. Gary Howell, the chair of the Natural Resources Committee, to support this resolution. The people who have been exposed to these chemicals deserve answers. The Michigan Department of Environmental Quality estimates that each year, 9.4 billion gallons of raw sewage enter Michigan waterways from leaking septic systems. For nearly 20 years, the state legislature has debated this issue, yet Michigan remains the only state in the U.S. without a uniform sanitary code requiring periodic inspections of septic systems. Two bills currently being debated in the State House Natural Resources Committee would create a statewide sanitary code requiring periodic inspections, however they would not create the sort of sustainable funding mechanism that would make this a viable long-term solution. Read more, and take action!